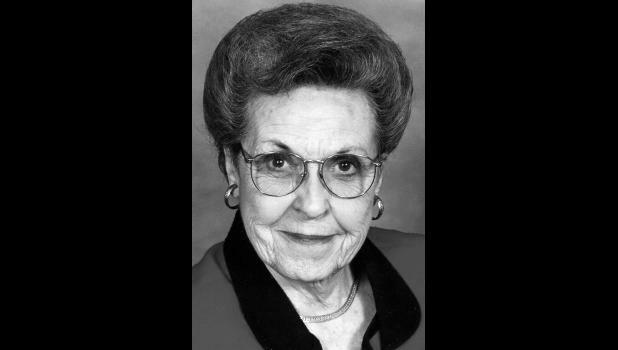 Juanita May Cozad, 93, Holton, died Wednesday, Jan. 28, 2015, at her daughter's home in Topeka. She was born Jan. 4, 1922, in Holton, the daughter of Otis and Mabel Decker Duffy. She gradu­ated from Holton High School and cosmetology school in Topeka. Mrs. Cozad lived most of her life in Holton and was a homemaker. She was an active member of First United Methodist Church in Holton, P.E.O., Beck-Bookman Li­brary and Tourist Club. She married Eaf Ramsey. He was killed in France during World War II. She later married Jack D. Cozad on June 29, 1946, in Holton. He died Nov. 3, 1992. Survivors include a daughter, Nita Diane Cozad Bowers, Topeka; a grandson, Adam Steven Chapman and wife Bonnie, Topeka; a great-grandson, Aidan Steven Chapman; and a first cousin, Mildred Alley, Holton. Graveside services will be held at 2 p.m. Tuesday in Holton Cemetery. The casket will be closed. Mercer Funeral Home in Holton is in charge of arrange­ments. Memorial contributions may be made to Beck-Bookman Library or First United Methodist Church, sent in care of Mercer Funeral Home, P.O. Box 270, Holton, KS 66436.